Find out why these stocks have done so well. The stock market has flattened out a bit over the past month, but major market benchmarks remain quite close to their all-time record highs. Yet even though the broader market has put up impressive performance in recent years, several stocks have managed to do even better -- doubling in value in just the past year. Micron Technology (NASDAQ:MU), United Rentals (NYSE:URI), and Arista Networks (NYSE:ANET) have very different business models, but what they share is strong fundamental business performance that has lifted their shares to new heights since early 2016. In the past, the memory chip market has gone through boom and bust periods repeatedly, but Micron Technology has enjoyed extremely strong conditions in the memory market recently. In particular, the DRAM market has been responsible for a big part of Micron's success, accounting for nearly two-thirds of its overall revenue and capturing a wide array of business, ranging from traditional PC and server applications to mobile devices and specialty uses in the automotive and graphics industries. Supply constraints have led to a rare increase in DRAM prices, and improving cost efficiency helped Micron widen its margin on sales. At the same time, NAND chip demand also strengthened, and even though a drop in sales prices weighed on profits, Micron managed to cut its expenses by an even larger amount. Micron sees signs of future strength continuing into 2017, and it projects that the current favorable cycle could keep going for quite a while. Downturns in this cyclical market are inevitable, but for now, investors are reaping the rewards of their patience with the memory maker. United Rentals thrives when the construction and infrastructure industries are strong because the company specializes in renting industrial equipment to customers in those sectors. The company has done a good job of weathering difficult times in some of its target industries, including the energy sector, and more favorable prospects looking ahead suggest that even better results might be right around the corner. In particular, the Trump administration's promise to dedicate more federal funding to infrastructure improvement projects should bode well for United Rentals' business. At the same time, the company's acquisition strategy is also fostering growth, including the acquisition of NES Rentals for $965 million to broaden United Rentals' footprint to cover the East Coast, Midwest, and Gulf of Mexico regions more effectively. If new growth opportunities do pan out, then United Rentals could have more room to run. Finally, Arista Networks has done an excellent job of capturing the demand for cloud-related and enterprise server business. Despite going up against much larger competitors, Arista's open source approach has resonated quite well with customers who want to customize their technology installations to meet their own particular needs. At the same time, key partnerships with other providers have helped Arista keep up with the industry, even as it keeps pushing forward. If anything, cloud computing has only become more important over time, and Arista is doing everything it can to offer a full suite of technology services that can keep up with the evolving needs of its customer base. The company believes that 2017 should be even better for its business, and the growing popularity of the Arista ecosystem should deliver network benefits that keep helping the networking specialist going forward. Over time, Arista has the power to keep growing alongside the cloud computing industry. 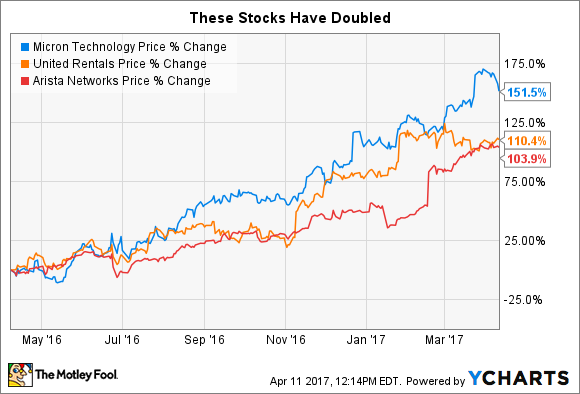 A stock that doubles is a rarity, but these companies have good things going for them. Although Micron investors need to be aware of potential cyclical issues, United Rentals and Arista Networks are riding long-term industry updrafts that could keep the stocks performing well into 2017 and beyond.